The children of parents who cannot read face serious potential problems in terms of their own literacy. As their parents are unable to take an active role in assisting them when it comes to learning to read, they are at a higher risk for not engaging in or taking seriously the act of reading. If you are in a position to help a child whose parents cannot read, please carefully consider the following ways that you can step in and provide low-key, but incredibly important, assistance. Whether you’re the child’s neighbour, teacher or babysitter, you can take an active role in reading to and with the child whose parents are unable to do so. Whenever you plan to see the child, bring along books (he or she may have none to read at home), turn off the telly and video games, and do your best to make reading as fun as possible. Some parents are not open about their illiteracy; however, if they are willing to confide in you that they cannot read with their children, take the opportunity to see how you can assist them. One caveat, though – don’t force them to try to learn to read themselves. You’ll only make them feel inadequate, angry, or embarrassed, which isn’t going to be helpful to the youngster. It’s great to be upbeat about reading in general, but make sure that you don’t say anything that could be construed as rude or uncaring about the child’s illiterate parents. Doing so could make him or her feel very uncomfortable in your presence, which would defeat the experience. Instead, talk about how reading has helped you and how much you love being able to read books, newspapers, magazines, websites, etc. 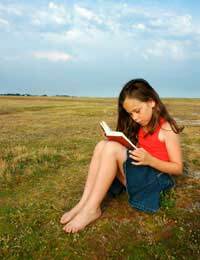 If you are around the child on a regular basis, make certain that you read in front of him or her. Pick up a magazine, thumb through the newspaper… those simple acts will show the youngster that reading is an activity that’s natural and enjoyable. Remember – he or she might not see anyone reading in his or her household… ever… so it’s up to you to demonstrate why literacy is so important. Are you the child’s godparent, aunt, grandparent, or other close relative? If so, you may be in a position to be able to talk with his or her teacher about how you can assist in the reading process. (Obviously, you’ll need to have permission to have this tête-à-tête from the child’s mum or dad.) That way, you can coordinate your efforts with the educator in order to build upon what the tot is learning in the classroom. Finally, don’t forget that simple phrases like “Way to go!” and “I’m so proud of you!” can honestly make a youngster feel amazing. Even if the child is just finally connecting the letter “n” with the sound “nnnnn”, be highly supportive. Sure, it’s a small step, but the road to literacy is filled with such tiny achievements. Make sure you’re cheering for the child the whole way!